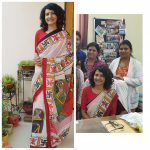 In Kannada the word for embroidery is Kasuti. As with the chikan of Lucknow so with the Kasuti of Karnataka the word has become identified with the particular type of embroidery produced in that area.Elephants with howdahs, peacocks with spread plumage, birds of different kinds, animals and flowers are standard motifs.The basic embroidery stitches used in Kasuti work are the back stitch, running stitch, cross stitch and zig-zag running stitch..this saree is treasure .My bhabhi Aarti bought for from Darward in Karnataka.this off white and red border. 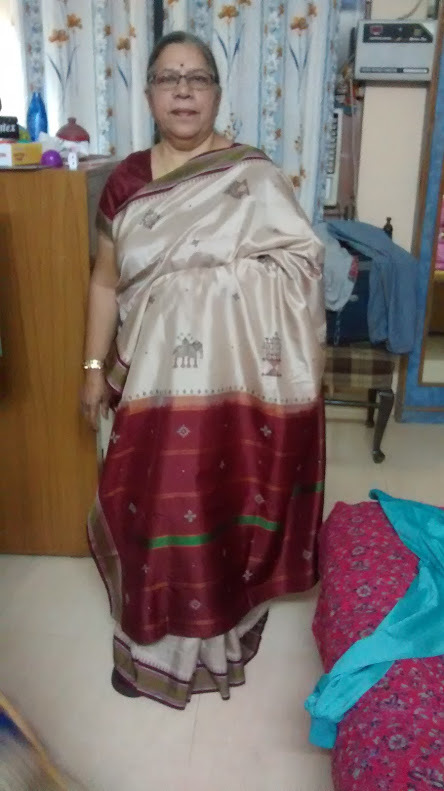 Donot miss elephant on pallu.Which is very beautiful.This is 20 years old saree.